Behind the Bit: Ariat Denim Breech Giveaway! Here is how much I love you guys. Ariat -- yes, Ariat! -- contacted me about doing a breech product review and offered to send me a pair, gratis. Here's how. I'm a long-time customer of Ariat -- I counted about 7 logos on clothing that I currently wear, never mind what I've purchased in the past. I had just purchased a pair of their Ariat Performers color block breeches from a local tack store (here they are pictured right, from *Victory Canter). Bob says I have too many clothes, and I DO have too many breeches. Instead of adding to my already abundant breech stack, I asked Ariat if we could do a giveaway. Score! Thanks so much to Ariat for sponsoring this breech giveaway. If you like DENIM -- and who doesn't? The giveaway is for a pair of denim breeches valued at over $100, and the winner will have a choice of two styles: a plain-stitched pocket and a flap pocket. Just fill out this giveaway form to enter. TAKE A LOOK AT THE GIVEAWAY!!! I have a detailed description and enlarged photos of both breeches. Wow! Would love to win a pair of denim Ariat breeches :) Thanks for offering the giveaway! Very kind of you to share! I'm not a fan of denim breeches, but I know someone will be super excited to win these. 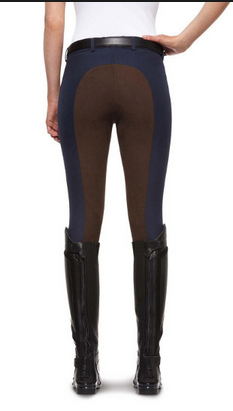 I would love to win some new breeches and with these I could feel less guilty about riding in jeans (sorry, saddle). Thanks! That's very nice of you! These look super cute! These look awesome! I love Ariat anyway and always ride in jeans so this would be perfect! Cool colour! Takes me back to the days when we could swagger around in our awesome brick-toned breeches.